This Apricot Salted Caramel Oreo Tart is made with a crust of thin Oreo biscuits as its base, then a pastry cream is added on top, followed by a thin layer of salted caramel, then a mousse, made with lemon flavoured French buttercream (pâte à bombe), combined with whipped cream and topped with the apricots and the salted caramel. I made this tart with the leftover French buttercream when making my husband’s birthday cake. In the buttercream, I added whipped cream and the cream I removed from the biscuits and flavoured it with lemon. No additional sugar was added. After making the caramel, I cooked the fresh apricots in the caramel for a few minutes. If your apricots are not very ripe, cook them up to five minutes and reduce time, depending on how ripe they are. I then added salt and heavy cream to make the salted caramel, in which I added gelatine to help the caramel set. I cannot get over this delicious tart as there are three layers of decadent lusciousness there plus the juicy apricots on top and let’s not forget the oreo tart crust. I know it is a bit time-consuming to make all the steps, but it you have the buttercream prepared ahead, as I did, as it holds well in the fridge for a lot of days, then the rest can be made in a couple of hours and the result will compensate you for all your effort! 2 packets (minus 2) thin Oreo biscuits without the cream. Wash and remove the stones from the apricots. Put the gelatine leaves in a bowl and cover with tap water. Let it soak for five minutes. Prepare the caramel and cook the apricots for 3 – 5 minutes, depending on how ripe they are. Add the salt and heavy cream and cook for another minute. Add the gelatine and mix. Remove the apricots and set aside. Remove the cream from the biscuits and crush them together with the butter in a food processor. Transfer it into a 28 cm tart pan and press it evenly with your fingers to make the tart base. Prepare the pastry cream and put it on top of the biscuits as well as a thin layer of caramel sauce. Prepare the buttercream and refrigerate up to a week (use half of this buttercream). Whip the heavy cream and combine it with the Pâte à bombe (no additional sugar is added). Mix in the cream from the oreo biscuits, add the lemon zest and Citrus essence and mix. Decorate with the cooked apricots. 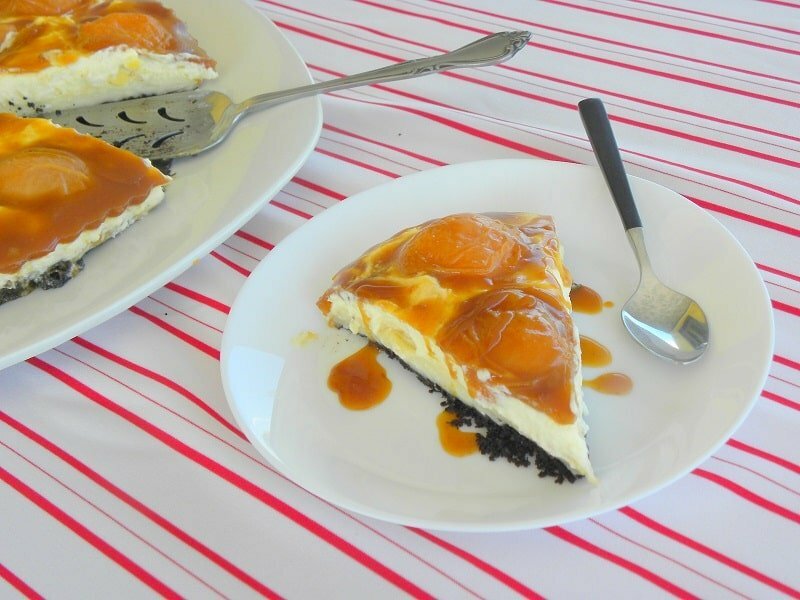 When the caramel sauce cools, spoon it on top of the apricots and refrigerate for a couple of hours before serving. If you like you can serve it with additional caramel sauce. You will love this Apricot tart, made with seasonal fresh apricots, oreo biscuits for its crust with two creams and salted caramel. Prepare the caramel and cook the apricots for 3 - 5 minutes, depending on how ripe they are. Prepare the pâte à bombe and refrigerate up to a week (use half of this buttercream). What a sophisticated apricot tart! I love the combo of mousse and caramelized apricots…an excellent dessert, Ivy.